“They [the poor] are part of today’s widespread and quietly growing ‘culture of waste. 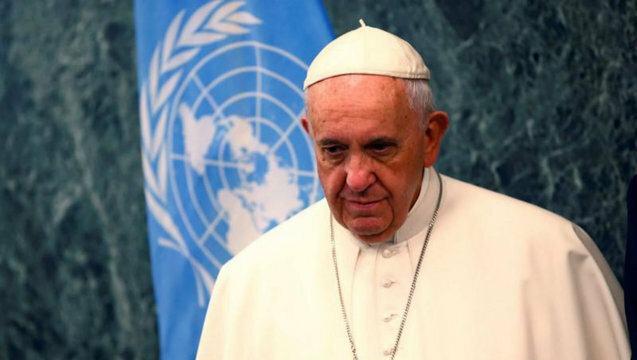 '”, said Pope Francis, speaking in front of UN delegates present for his speech in NYC September 25, 2015. For this reason I pay homage to all those men and women whose loyalty and self-sacrifice have benefited humanity as a whole in these past seventy years. In particular, I would recall today those who gave their lives for peace and reconciliation among peoples, from Dag Hammarskjöld to the many United Nations officials at every level who have been killed in the course of humanitarian missions, and missions of peace and reconciliation. First, it must be stated that a true “right of the environment” does exist, for two reasons. First, because we human beings are part of the environment. We live in communion with it, since the environment itself entails ethical limits which human activity must acknowledge and respect. Man, for all his remarkable gifts, which “are signs of a uniqueness which transcends the spheres of physics and biology” (Laudato Si’, 81), is at the same time a part of these spheres. He possesses a body shaped by physical, chemical and biological elements, and can only survive and develop if the ecological environment is favorable. Any harm done to the environment, therefore, is harm done to humanity. Second, because every creature, particularly a living creature, has an intrinsic value, in its existence, its life, its beauty and its interdependence with other creatures. We Christians, together with the other monotheistic religions, believe that the universe is the fruit of a loving decision by the Creator, who permits man respectfully to use creation for the good of his fellow men and for the glory of the Creator; he is not authorized to abuse it, much less to destroy it. In all religions, the environment is a fundamental good (cf. ibid.). To this end, there is a need to ensure the uncontested rule of law and tireless recourse to negotiation, mediation and arbitration, as proposed by the Charter of the United Nations, which constitutes truly a fundamental juridical norm. The experience of these seventy years since the founding of the United Nations in general, and in particular the experience of these first fifteen years of the third millennium, reveal both the effectiveness of the full application of international norms and the ineffectiveness of their lack of enforcement. When the Charter of the United Nations is respected and applied with transparency and sincerity, and without ulterior motives, as an obligatory reference point of justice and not as a means of masking spurious intentions, peaceful results will be obtained. When, on the other hand, the norm is considered simply as an instrument to be used whenever it proves favorable, and to be avoided when it is not, a true Pandora’s box is opened, releasing uncontrollable forces which gravely harm defenseless populations, the cultural milieu and even the biological environment. Such understanding and respect call for a higher degree of wisdom, one which accepts transcendence, rejects the creation of an all-powerful elite, and recognizes that the full meaning of individual and collective life is found in selfless service to others and in the sage and respectful use of creation for the common good. To repeat the words of Paul VI, “the edifice of modern civilization has to be built on spiritual principles, for they are the only ones capable not only of supporting it, but of shedding light on it” (ibid. ).